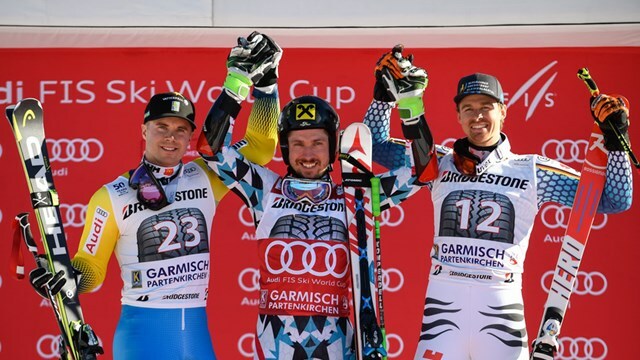 Garmisch-Partenkirchen, Germany – Austria’s Marcel Hirscher skied to his 20th career Audi FIS Alpine Ski World Cup giant slalom victory in Garmisch on Sunday by a massive 1.50 seconds ahead of Matts Olsson of Sweden in second, and 1.95 seconds in front of Stefan Luitz of Germany in third. With his victory, Hirscher pulled further ahead of Norway’s Henrik Kristoffersen, who finished seventh Sunday, in the overall World Cup standings, 1260 points to 828. With only two giant slaloms to go (in Kranjska Gora and at the Finals in Aspen), Hirscher is leading with a 97-point margin over Alexis Pinturault, who despite finishing off the podium in fourth on Sunday is eager to claim his first giant slalom globe. Bend, Ore.’s Tommy Ford picked up his third World Cup top-15 giant slalom result of the season, finishing 14th. Reno’s Tim Jitloff, who is returning to form following a back injury last month, posted his first top 20 of the season, finishing 20th on the demanding and dark Kandahar course. Ford started 26th and finished 10th in the first run. In the second run, he made a slight mistake, but kept charging to the finish. “I made a mistake up higher and I felt like I had to kind of push it,” Ford said. “I was right on the edge, and there is a little shelf in there that was hard to see, but I was still going, skiing well. “Today was really good. I skied really well and had a good time doing it. I made some improvements; I’m ready for the next one,” he added. Sunday’s race was the final World Cup giant slalom before next month’s FIS Alpine World Ski Championships in St. Moritz, Switzerland. Up next, the men compete in a City Event in Stockholm, Sweden, Tuesday.